Silver State is announcing an exciting new direction with our READY FOR WEAR fabric collection. READY FOR WEAR is the marriage of our many years of experience in the Residential and Hospitality world. While we have created a highly stylized, comfort driven Residential look, it has all the requirements of Hospitality (50,000 + double rubs, flame codes, and clean ability). READY FOR WEAR is a response to the times we live in and where the places we work, live and play are integrated and no longer mutually exclusive. Silver State has packaged this collection as the first in a series of Color Books. Our clients are our guides as to which colors are needed to satisfy THEIR client’s needs. 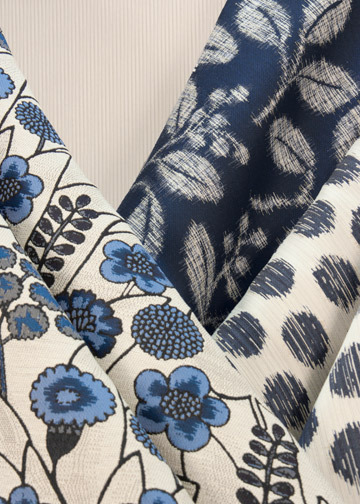 This season, we are introducing two stunning and separate palettes – Indigo and Natural. As always, with Silver State, the books will complement each other in both color and scale (from midsized to solids). In addition to being stain resistant, meeting commercial flame and wear codes, we have tested every fabric for compatibility with a variety of NANOTEX® and CRYPTON® finishes.